AMMONNEWS - Applications for specialization in the faculty of Amman will begin Tomorrow Thursday 14 Febreaury . The first university to offer "logistical support" at the level of the intermediate certificate provides real and pioneering job opportunities for graduates of this specialization in cooperation with major companies. The university aims to localize the international experiences in its faculties and respond to the requirements of the market. The university is in the program with the German Agency for international development and cooperation. 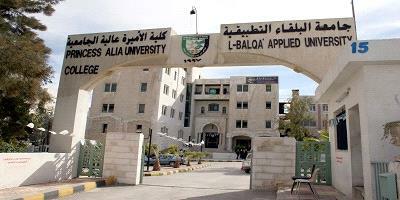 Al-Balqa Applied University announced today the launch of a pilot program in Jordan and the region,a program for logistical support at intermediate certificate with the German international cooperation GIZ and the industrial sector. The program aims at providing university students with practical knowledge and skills in the field of logistics activities in a real work environment. The program contributes to the enrichment of applied education within the university through the practical application and training stages that the students are going through with the companies participating in this program, and also provides the Jordanian market with graduates with high quality skills. The representatives of the companies and organizations concerned said that the program was not only an investment in the future of the youth but also an investment in the future of the companies and thus the advancement of the Jordanian economy in general. The program aims at providing students with specialized knowledge and practical skills in the field of logistics activities in a real work environment. The program involves the art and management of the flow of goods, energy, information and other resources such as products, services and even production to the consumption area. The program also deals with logistics, evacuation and other activities, such as traffic, transportation, storage and others. The program is also interested in the methods of designing the internal factories to provide an effective flow of workers, goods, equipment and information to ensure the highest level of productivity at the lowest costs. The program will also focus on productivity by determining the extent of logistics capacity to accommodate the quantity of production and length of production lines. Graduates of this program can bridge the logistics science program offered by the German-Jordanian University at the level of the bachelor's degree in cooperation with the German Agency for International Development and Cooperation (GIZ). The University is currently working with relevant companies to ensure that students are recruited after graduation.